Established in the year 2009, We are involved in manufacturing, exporting, trading and wholesaling a huge assortment of Tea & Coffee Vending Machines and Premixes. The vast range offered by us includes Single Serve Sachets of Coffee, Ginger, Elaichi & Masala Tea in many flavours like Ginger, Cardamom, Masala, Lemon etc. Additionally, we also offer Vending Machines like , Three Lane Vending Machine, Four Lane Vending Machine. These machines are acknowledged for their user-friendly operations, easy maintenance, high performance and long service life. Our premixes are safe to consume, hygienically packed, and rich in flavor & aroma. 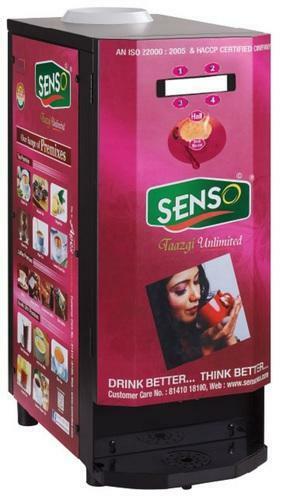 We are deal in our own manufacturing brand name as Senso and other one is Lilac. Leveraging on its vast distribution network, we have garnered a huge client-base spread across the globe. Our clients highly appreciate the exceptional quality products & services offered by our organisation at most reasonable prices. Further, the privilege of accepting a host of payment modes like Cash, Cheque and DD has won us the faith of our valued clients.